Hotel India is a 2 star deluxe hotel in Nainital, conveniently located in front of Nainital Lake at Mall Road. 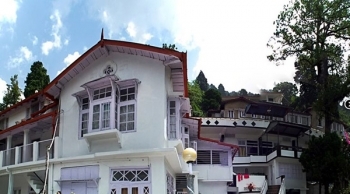 The hotel is a perfect blend of beauty and hospitality on the mighty slopes of Nainital. You can spend a quality time free from worries of the world with the spectacular view from the hotel and prompt service by the staff. 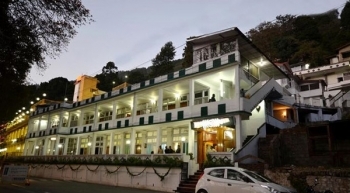 The hotel is centrally located on Mall Road in Nainital. Regional attractions are : Naina Peak (6 kms), Lands End (6 kms), Water fall (10 kms), Raj Bhawan (3 kms), Dorothys seat (4 kms), Hanumangarhi (3 kms), Snow view (2.5 kms), High altitude Zoo (300 mt), Cave Gardens (4 kms), Observatory (12 kms) and Kilbury (16 kms). The hotel is entrusted with contemporary designed elegant rooms with all amenities stocked with it. The rooms are classifies into different categories : Deluxe, Suite, Family Suite, Cottage and Standard. Small terrace and sit outs is an add on in the hotel offering magnificent view of the emerald lake and Nainia Devi temple. The hotel offers a well lit warm ambience restaurant which serves Indian, Continental and Chinese cuisine to its guests. The restaurant is open from 7am to 10 pm during summers and 7 am to 9 pm during off peak season and offers all day in room dining. You may drive up to Nainital set among the Himalayas which will give you the unique opportunity to enjoy some mystical views. It takes about 6 hours by road up to Nainital and 5 hours by an overnight train from New Delhi. New Delhi is 320 kms away from the Himalayan paradise Nainital which takes almost 7 hrs to reach the destination. Kathgodam is the nearest railway station to Nainital situated 40kms before Classic The Mall. Kathgodam is well connected by railway networks. Nainital is well connected by motorable roads. Buses and taxis to Nainital are easily available from major parts of North India. Buses from ISBT Anand Vihar to Nainital are easily available.